Mr. Bui is an experienced civil litigator, concentrating on construction law and contract disputes involving complex construction projects throughout California. Mr. Bui represents developers, general contractors, owners, sureties, and subcontractors in claims involving large scale private developments, both commercial and residential, public works, freeways, bridges, schools, and water reservoirs. These projects have ranged from 5 million to 1.6 billion dollars. His global approach to cases – always looking towards what best serves the short and long term interests of his clients – has achieved great successes for those clients and has personally earned him numerous honors in California and the legal community. Though his trial verdicts are the true testament of his successes, Mr. Bui has also been repeatedly distinguished by California Super Lawyer Magazine as a Rising Star under 40 and his jury trial work, has earned him a spot on The Recorder’s coveted Top Verdicts publication for the highest 100 California jury verdicts over a million dollars. Additionally, he has been recognized for his support of the asian legal community and has held executive office in the Vietnamese American Bar Association of Northern California. Mr. Bui’s litigation practice includes aggressive advocacy of his client’s rights and interests including through mediation, arbitration, and trial. 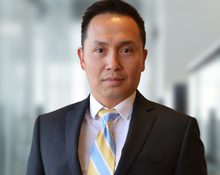 Prior to joining McInerney & Dillon, Mr. Bui was involved in civil and commercial litigation, including products liability, workers compensation subrogation, premises liability, general insurance defense and contract disputes. Recognized as a Rising Star under 40 in California Super Lawyer Magazine from 2011 through 2014. Mr. Bui is committed to supporting the local community and is actively involved in community organizations and has been an executive board of the Vietnamese American Bar Association of Northern California.